Almost every Costa Rican village has a soccer/football field in the center of the village. This photo shows yet another example. I think you could fit most of the houses of this village within the soccer field in the middle of the village. We have photos of the statues on the beach of Easter Island this week on our Viva la Voyage travel photo site. I can't think of a better place to walk a dog than along Tamarindo Beach. I am sure that the couple and the dog in this photo are enjoying the sand between their toes, the waves lapping at their ankles, and the view of the ocean, waves, boats bobbing in the bay, and the hills surrounding Tamarindo Bay. My wife and I love to walk along Langosta Beach, around San Francisco Point, and then down this stretch of Tamarindo Beach. We walk to dinner this way most evenings when we are staying in our Langosta condo. For views of a unique beach, with moai statues on Easter Island, please visit Viva la Voyage, our travel photo site. Flying buttresses in the trunk of a tree serve the same purpose as flying buttresses in the side of a cathedral. The buttresses add strength to the tree trunk to support the giant size of the trunk and tree above. This week on our Viva la Voyage travel photo site we are showing photos of moai statues on Easter Island that are located on a sandy beach. This is different than the type of photo that I usually post. This is moss that certainly is not growing on a rolling stone. Tomorrow I will show where this is growing. Here is another photo of my brother-in-law on Langosta beach, which I also showed yesterday. This photo shows the view up the beach and illustrates one of the things that we like about Langosta -- the lack of crowds. As this photo shows, there is no one else lounging around on this stretch of beach. Langosta is a quiet, residential area. Some people walk up and down the beach. Occasionally someone like my brother in law will plant themselves on the beach with a beach chair or towel. We never see a scene like beaches in the USA where you have to worry about other people nearby making noise, playing loud music, or kicking up sand as they walk by. For a very different beach scene, check out our photos of Easter Island this week on our Viva la Voyage travel photo site. This is a photo of my brother-in-law from when he visited Tamarindo last year. He planted himself on Langosta Beach right behind our condo. Judging from the color of his skin, he does a good job of covering up even though he lives in the intense desert sun of Phoenix, Arizona. That is smart, given what the sun can do to one's skin. He is positioned facing the Pacific Ocean, and several thousand miles away is Easter Island, with it mysterious statues that are the subject of our post this week on Viva la Voyage, our travel photo site. I have shown photos of several other beaches recently, such as Playa Panama, Playa Hermosa and Playas del Coco, so I thought I would post photos of Tamarindo and Langosta beaches for a few days. This is a photo of Tamarindo beach, looking from the south to the north, at low tide. You can get an appreciation from this photo of how gently sloping the beach is. Swimmers can wade out into the water a long ways and still stand up. This southern end of Tamarindo bay is protected from the ocean waves by an island and reef to the left of this photo. The area for surfers is to the right of this photo. Today is Sunday, so we have new photos posted on our travel photo site, Viva la Voyage. This week we are showing photos of some of the maoi statues on the beach at Easter Island. I think the highway engineers got a little carried away when they designed the sign in this photo. I have never seen a car on a hill this steep. Not even in San Francisco. I think this sign succeeds in getting attention and communicates its message. This week we are showing photos of Iceland on our Viva la Voyage travel photo site. If Costa Rica is going to start putting up signs like this around all of the curvy, hilly roads, I recommend an investment in the sign company. This signage and the guard rail look like what one would expect in the USA, not a rural Costa Rican road. If there are condos in the hills around Costa Rican beach towns, there must be roads to reach them. 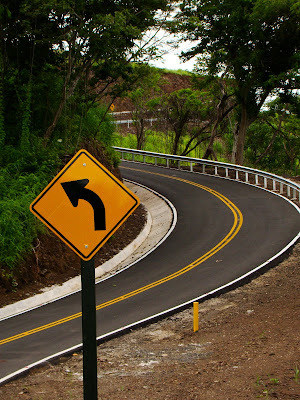 Here is an example of a new hilly, curvy road to reach some of the hotel and condo deveopments in the area around Playas del Coco, Playa Hermosa and Playa Panama. This reflects that Costa Rica has made improvements and investments in its roads in rural areas. People who own projects in areas that are waiting for the completion of paved roads are encouraged by new roads such as this, and hope that the roads will be upgraded in their areas soon. This photo shows an unfinished condo project on which there is no sign of continuing construction. Some buildings are nearly complete, but empty. Others are an unpainted shell, without roof tiles. The swimming pool is empty. The deck is a steel frame, but no deck. A very few units are completed and occupied. This is a sad scene. It reflects a developer who has probably run out of money and, more important, purchasers who have paid money and have not realized the enjoyment and benefits that they expected. During the boom years of 2000 - 2007, many new condo projects were sold, and it was common for the purchase price to be paid 1/3rd down, 1/3rd when the roof was installed, and 1/3rd at closing. This means that some people have paid a substantial amount of money and it is uncertain when, or whether, they will receive delivery of a new condo. Developers were building projects with financing from buyers, but if the projects did not sell out or if the buyers did not make their second payments when the market collapsed, some developers ran out of money to finish the projects. Julie and I bought both of our condos in projects developed by the owner of the Tamarindo Diria Resort, the largest hotel in the area. We figured that he would have the resources to finish the projects, and he did. Both projects are successful. People like to say that real estate is a matter of "location, location, location," but it is also a matter of "timing, timing, timing." The difference between some successful projects and projects such as the one shown today in some cases is that the failed projects hit the market at the wrong time. This photo shows a hilltop condo development, with a view out to the ocean. During the real estate boom from about 2000 - 2007, there were quite a few ocean view condo developments. In my opinion, some of the developments, such as this one, reflect the fact that developers thought anything with an ocean view would sell. For the boom years, that was correct. Some projects lacked creativity and quality amenities. This photo shows a condo project that consists of unimaginative, square buildings, without architectural features, and with few amenities other than a view of the ocean. Many Americans within the past 10 years bought ocean view land relatively cheap, as the land had little previous economic use, and built projects such as this. During the development frenzy of about 2000 - 2007, projects like this would sell. Since that time, however, the market has been soft because the downturn in the U.S. economy affected the willingness or ability of Americans to buy a vacation or retirement condo in Costa Rica. Tomorrow I will show what happens to a condo development that was under construction when the market turned soft. Here is another photo of the type of houses and condos that have been built in the hills above places like Playa Panama, Playa Hermosa and Playas del Coco. These homes have views out to the ocean. The views are nice, but as I mentioned yesterday and several people who left comments agreed, I prefer a condo where we can walk to dinner and enjoy the activity of a community like Tamarindo, rather than a hilltop where you have to drive everyplace you want to go. Plus, we like to walk out our door to the beach. Tomorrow and the day after I will show more of the recent real estate boom, and will discuss that real estate is more than "location, location, location." This photo shows some houses or condos across the bay at Playa Panama. These people have a nice view of the bay and ocean. My wife and I prefer Tamarindo, however, where we have a view of the beach and ocean, but there are also about 40 or so restaurants to which we can walk for lunch or dinner. A house or condo in a place like this would require driving to dinner, or cooking yourself. Hotels in places like Playa Panama are destination resorts, as there are not many places where you can walk and enjoy both the beach and a variety of restaurants. Today is Sunday, so we have new photos on our Viva la Voyage travel photo site. This week we are showing some photos from Julie's brother's trip to Iceland. Here is another view of the bay at Playa Panama, shot with a telephoto from the same spot as yesterday's photo. As this photo shows, there is lots of land around and some people have got caught up in the real estate boom of 5 or 6 years ago. In a few days I will show you the sometimes not-so-successful results. This week we are showing photos of the cathedral in Como, Italy on our Viva la Voyage travel photo site. This is a view of Playa Panama from the road approaching from the south. This shows something that I commented upon yesterday, which is there there is not much of a town at Playa Panama. Some people enjoy building houses in the area, or buying condos, that have ocean views, such as the houses in this photo and a few more photos that I will post in the coming days. Here is a photo of the beach at Playa Panama, looking in the opposite direction from the view that I howed yesterday. As I commented yesterday, the beach here is so sheltered by the bay that it is similar to the shore of a lake rather than the ocean. I did my little road trip to the beaches about an hour north of Tamarindo on a cloudy day, and there were not many people out on the beach. There is not much of a town at Playa Panama. There are some houses, condos and hotels scattered around. This is a photo of the beach at Playa Panama. It is sheltered by the its location within the a bay deep in the Gulf of Papagayo, so it does not receive ocean waves or surf. It is ideal for easy swimming. This area has the advantage of having the closest beaches to the international airport in Liberia, just about one half hour away. There is a Hilton Papagayo Resort near this spot. It is an all-inclusive resort where guests pay one price that includes their room and their meals. I have stayed in all inclusive resorts in very remote locations, such as Easter Island, Torres del Paine National Park near the southern tip of Chile, and the Atacama Desert, but my wife and I prefer getting out and enjoying some of the local restaurants in communities that have good restaurants. Today I will begin a short series of one more beach north of Tamarindo, close to the Gulf of Papagayo. This area is under the location where airliners fly over the Pacific Coast of Costa Rica when they make their approach to the international airport in Liberia, about one hour north of Tamarindo. I previously showed photos of Playas del Coco and Playa Hermosa. The area under the aerial photo I am showing today is Playa Panama. Tomorrow and the next day I will show this area from the beach. Yesterday I showed a monkey in his natural habitat. Here are some monkeys not in their natural habitat. These monkeys have jumped onto one of the tour boats that takes visitors on wildlife boat trips in Palo Verde National Park. The monkeys are quite used to the visitors. Although there are signs asking people not to feed the wildlife, people find it irresistible to feed the monkeys. They are playful and smart. They have learned to expect the tour boats at certain spots on the river. They have trained the tourists to hand them banana pieces. This week we are showing photos of the cathedral of Como, Italy, on our Viva la Voyage travel photo site. This is a photo of a white-faced Capuchin monkey reaching into a hole in a tree for some food. I don't know what he thought he would find. Maybe some bugs. I don't know about you, but I would not stick my hand into a hole in a tree. This monkey is braver than me. I apologize for the quality of this photo. I took this picture in very low light with a slow shutter speed, as this monkey was under a very dense tree with a heavy canopy. The scene was dark and I had to lighten the photo and it is not as crisp as I would like, but I thought it is still worth posting because it shows the monkey in his natural habitat. Today is Sunday, so we have new photos on our Viva la Voyage travel photo site. This week we are showing photos of the cathedral in Como, Italy. This photo completes my little series about our condo at the Tamarindo Diria Resort. Our building is seven stories tall, and our condo is on the fourth floor. There is a palm tree the the center of this photo, and our condo balcony is barely visible through a hole just under the palm fronds of that palm tree. This swimming pool, parts of which I have shown in the past, is a free-form pool, with walk-in beach type sides, islands, bridges, fountains, and a swim up snack bar. It is the largest pool in the area (10,000 sq. ft./930 sq. m.). Some people who stay in the hotel rooms at the Diria Resort do not even know this pool exists, as most people hang out at the nearby beach, and there are two more pools facing the beach that are very popular. This week we are showing photos of the red rock country of Sedona, Arizona and the cooling waters of Oak Creek on our Viva la Voyage travel photo site. Resort. Our condo, which I showed yesterday, is on the fourth floor of this building. Our balcony is barely visible in the top center of this photo. These gardens surround a large swimming pool and are very pleasant to walk through on the way to the beach or to the main beachfront street where many shops and restaurants are located next to the resort. A few days ago I showed a photo of the walkway to our condo at the Diria Resort. I received more comments than usual, so I thought I would show this photo of the view from the bed in our master bedroom. Yes, a view like this does make it easier to get up in the morning. There is a small "Juliet" balcony on the right, with a view across to Playa Grande. On the left is a door to the balcony off the living room, with a splendid view of the beach and ocean. The trees are part of the lush landscaping of the Diria Resort. I will show a couple of photos of the reverse view from the ground during the next two days. Playa Grande, by the way, is the nesting site for the endangered Pacific leatherback turtles and is a protected national marine park. The tortoises swim to that beach all the way from the Galapagos Islands to lay their eggs. The little dog in this photo seems to be putting on the brakes so he does not get in the way of the bigger dog. It is nice to see dogs playing together nicely. "Hey, little dog. Wait for me." As regular readers of this blog know, I like to post a series of photos that tell a little story. This photo shows more of the scene when the lady with the three tiny dogs walked along the beach. This little girl seems to want to follow the dogs, sort of like the Pied Piper. The 3 little dogs I showed yesterday were hyper-active in exploring the beach and in making friends. Tomorrow I will show the dogs interacting with another four legged creature. I like to walk along the beach in Tamarindo and Playa Langosta. In addition to the surf and sand, the beach offers an opportunity to observe an array of animals, such as pelicans, sea gulls, iguanas, crabs, and some non-native species, people and dogs. What caught my eye in this photo were the three small dogs walking down the beach with the woman. The dogs were playful and active, exploring the beach and greeting the people and other dogs along the way. I took this photo on Playa Langosta using my zoom lens, which compresses the images in the photo and gives the appearance that these people were closer to each other than they were. Last evening I returned from a business trip, driving from Las Vegas to our home in Scottsdale, and I stopped the car several times to take photos of the dramatic Arizona desert sunset. The thought occurred to me that I have not posted photos of a Tamarindo sunset lately. Here is a photo of my younger son silhouetted against the brilliant sky of the sun setting into the Pacific off Tamarindo. 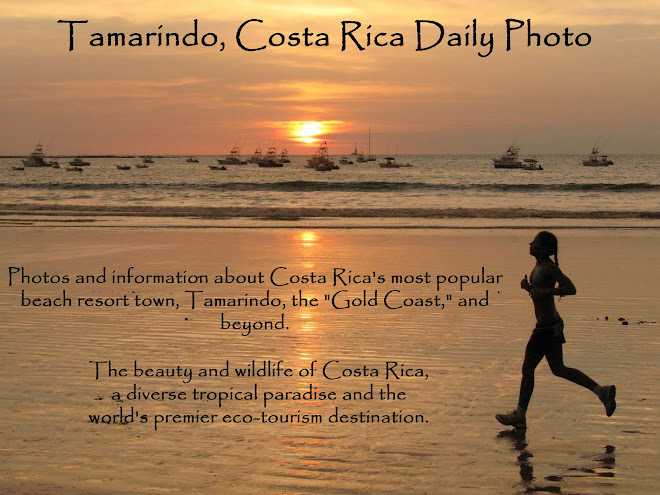 You can see why they sometimes refer to the area around Tamarindo as Costa Rica's "Gold Coast." I did not do anything to enhance the colors of the sunset. This photo is exactly how the camera captured the scene, using the camera's automatic exposure setting. Today is Sunday, so we have new photos posted on our Viva la Voyage travel photo site. This week we are showing photos of the red rocks of Sedona and Oak Creek Canyon, Arizona, including some photos of the rushing Oak Creek. This is another photo that I considered posting for yesterday's Daily Photo theme day of "edge." This is the hallway leading to the front door of our condo at the Diria Resort in the middle of Tamarindo. Our condo is on the right at the end of this corridor. It is a pleasant walk to return home and look out over the town, the beach, the boats in the bay, the endless Pacific ocean, and then to go into the condo, relax, and enjoy yet another view of the beach and ocean. For a view of an ocean (actually a fjord) filled with sailboats, and other delightful scenes of Norway, be sure to check out the photos on our Viva la Voyage travel photo site. The worldwide Daily Photo Theme for April 1 is "edge." Tamarindo is a small beach resort. It does not have a lot of "edges." But because the beach is the essence of the town, I selected this photo, as it shows multiple edges. There is the edge of the ocean, the edge of the beach, the edge of the clouds, the edge of the horizon, and the edge of a storm front.